CES 2015: Cabasse launches StreamAMP | What Hi-Fi? The StreamAMP has been announced as the latest addition to Cabasse's Stream line, allowing users to stream a multitude of audio files. It sports a compact, four-channel design, and the manufacturer claims it to be the "ideal building brick" of a Cabasse distributed audio system. The StreamAMP can stream files from downloads and CD rips via wi-fi or Ethernet, with the system controlled by the Cabasse StreamCONTROL app for iOS and Android. Your content can also be streamed wirelessly via Bluetooth and NFC, while wi-fi direct allows for a high definition connection. Internet radio stations can also be accessed through the unit, with streaming services Deezer and Spotify built-in. Audio files supported by the StreamAMP include WAV, FLAC, WMA, AIFF, AAC, ALAC and MP3 up to 24-bit/96kHz. Two pairs of loudspeakers can be used with the unit for stereo use thanks to the four speaker outputs. Meanwhile, mono distribution can be achieved with either two or four groups of speakers. Elsewhere, a power optimisation impedance switch lets the StreamAMP feed audio to up to eight Cabasse Archipel in-ceiling speakers. The preamp section of the StreamAMP features two analogue RCA inputs, an optical SPDIF input, a preamplifier output and a subwoofer RCA output. Cabasse has incorporated its own DSP (digital signal processing) into the StreamAMP. Using the app, select which speakers are being used and where they are in the room - the DSP engine then adjusts the sound settings accordingly. 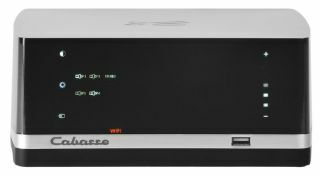 The Cabasse StreamAMP is expected to be available from February 2015 for £449.